My World Book Day post from The Headteacher’s Blog. A link on our staff intranet takes you to a Google Form, where you fill in your name, the name of the member of staff who did something nice, and what it was that they did. The results are collated by our HR team and run through a mail merge, so that every Friday afternoon you receive a certificate in your pigeonhole with the details of your shout-out. The certificates are also displayed on the staff room wall. 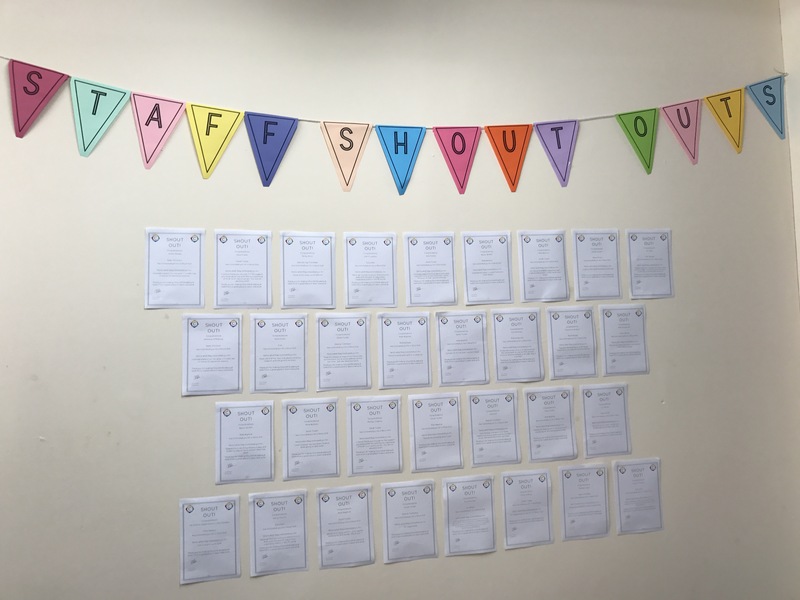 HR send out an all-staff email on a Friday afternoon containing the details of all the Shout Outs from the week, so that everyone can see the lovely things that have been going on. Every term, I use a random number generator to pick one Shout Out to win either a bottle of wine of a box of chocolates (their choice!) to say thank you. The winner, and a summary of all the term’s Shout Outs, are included in the termly HR newsletter and shared with the Governors. It doesn’t take the place of the private thank-yous that happen as a matter of course across the Academy, but when a colleague has gone out of their way, or over-and-above, or just deserves public recognition for their all-round niceness, the Shout Out is an excellent addition to the staff wellbeing strategy to foster a positive culture or mutual support, recognition, and celebration. I even got a Shout Out myself this week – for being supportive of the introduction of Shout Outs. My Desert Island Books – from The Headteacher’s Blog. This weekend (5-6th November) is “Love to Read” weekend, a campaign run by BookTrust and the BBC. There’s a wealth of programming across the BBC (read about it here) and as part of the campaign, Simon Mayo has been asking authors to share their six “Desert Island Books” on his Radio Two show (you can hear Marian Keyes’ choices here). Our wonderful LRC co-manager Mrs McGilloway suggested I share mine here…and I don’t need asking twice! You can read the LRC’s #LovetoRead blog post here.